Flying into El Calafate, the Patagonian landscape below was a uniform brown, that is, until we spotted an almost luminescent turquoise river snaking its way through the otherwise featureless earth below. A little further on and the river opened up into the blindingly blue Lago Argentino, a vast glacier fed lake that looks like it should be on another planet. 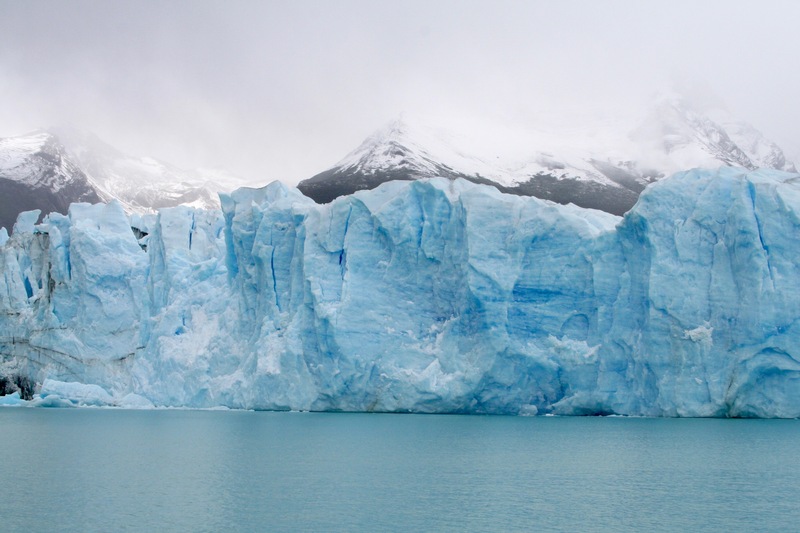 It was the glacial source of this extraordinary water that we’d come to see, and especially the Glaciar Perito Moreno – a truly glorious natural wonder. That tantalising glimpse from the air was thrilling. 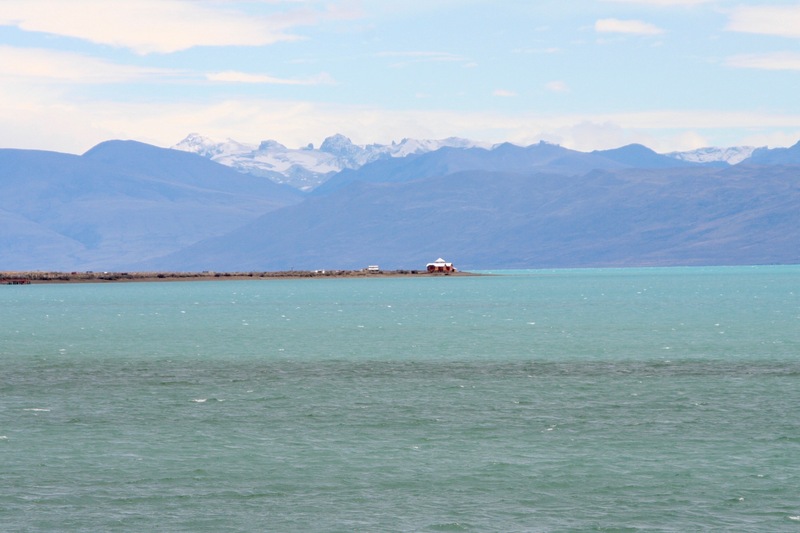 I couldn’t wait to get to El Calafate to arrange our trip to Los Glaciares National Park. This though would have to wait. Our bag arrived exactly last on the conveyor belt at the small airport and, by the time we got outside, we’d missed the last taxi. An hour later, a taxi showed up and we headed into the windswept and bleak streets. 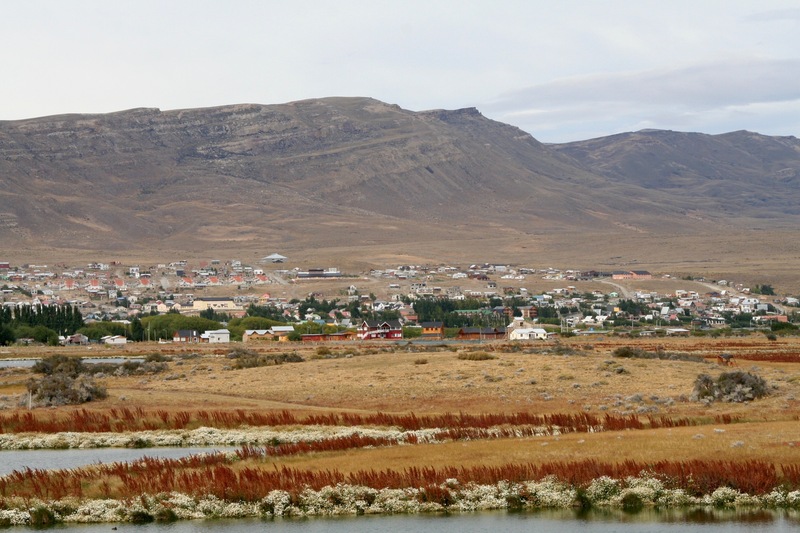 El Calafate has the feel of a frontier town, only instead of gold prospectors it’s home to outdoor enthusiasts and determined tourists. 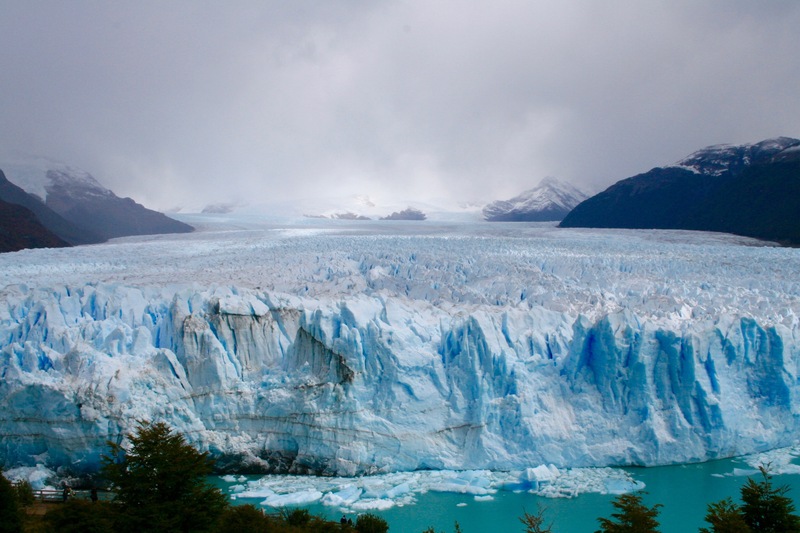 Like a frozen version of the Iguazu Falls, the Perito Moreno Glacier is unmissable. 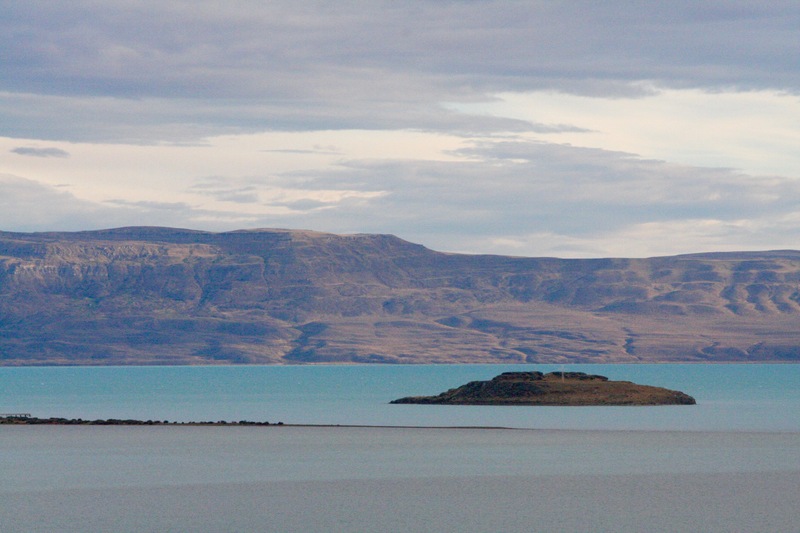 That is more than can be said for El Calafate itself. The surrounding area is beautiful, and it has views towards the Andes, but the downtown is filled with tourist shops and tour agencies. That said, it has some very decent restaurants. 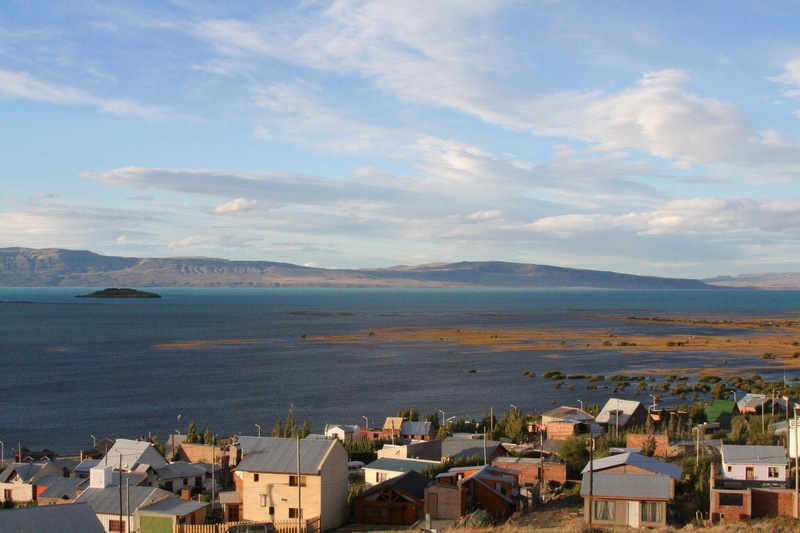 Radiating outwards from the compact centre is Patagonia’s version of urban sprawl. Dirt roads and wooden houses, that look like they could be put on the back of a truck and rolled elsewhere should the tourists move on. 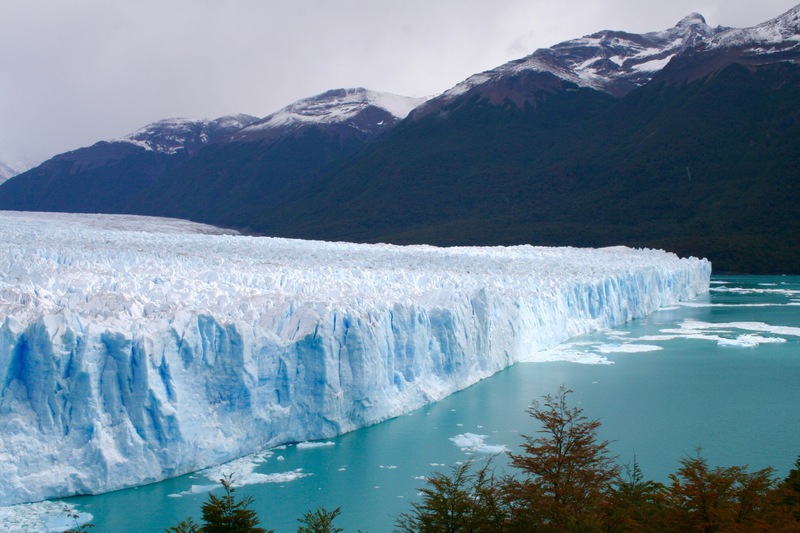 Perito Moreno is part of the Southern Patagonian Ice Field, the third largest reserve of fresh water in the world, and is shared with Chile. 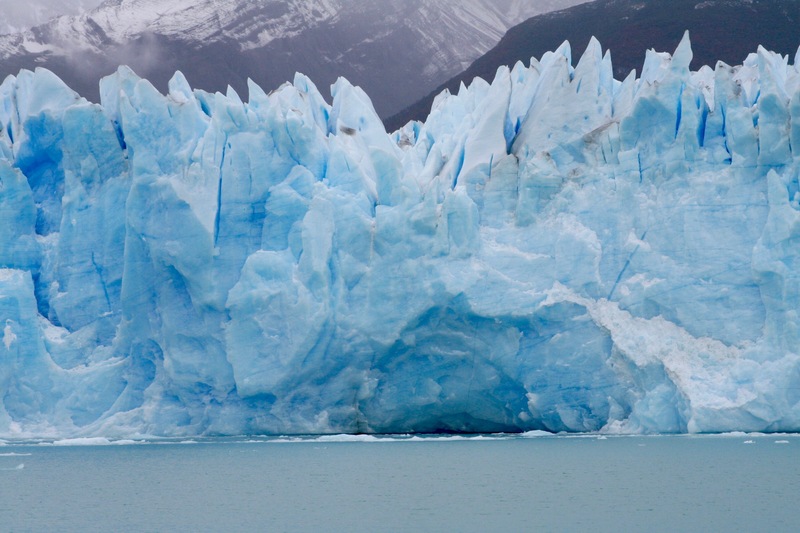 In an era of global warming it bucks the glacial trend and is slowly advancing rather than retreating. 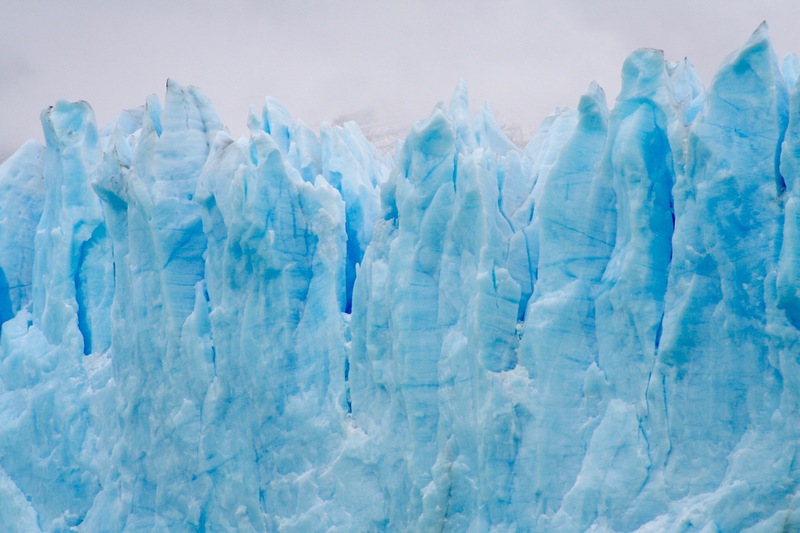 The front of the glacier is literally a wall of ice, reaching a height of around 70m in places. 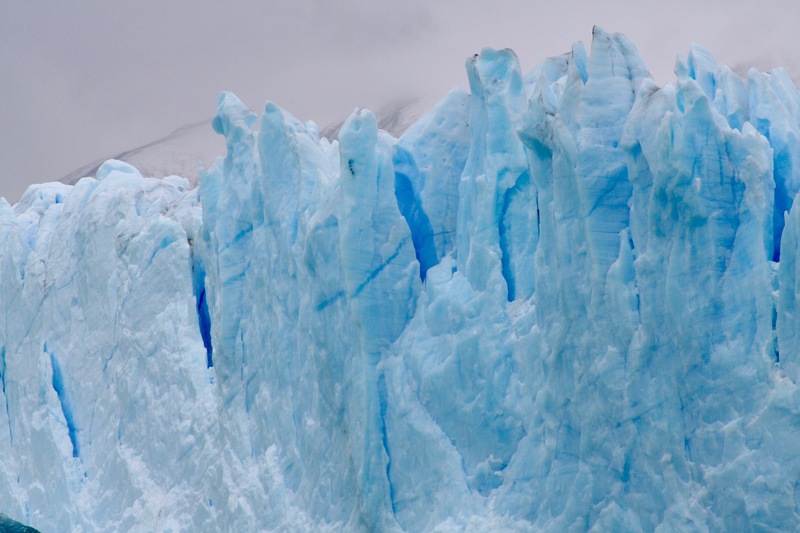 The exquisite azure, sapphire and turquoise colour of the ice is extraordinarily beautiful. Even on a cloudy and drizzly day, the ice illuminated the surrounding landscape. It’s simply stunning. It looks so peaceful, but it’s pretty noisy near the glacier. 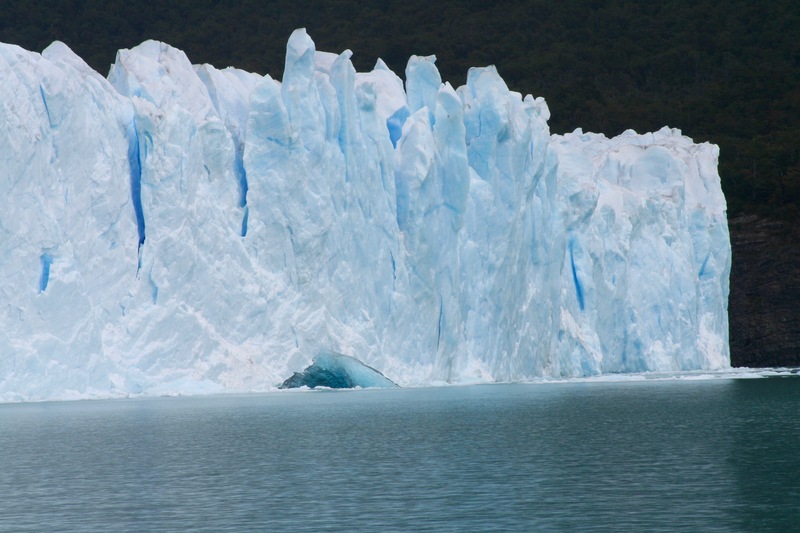 The massive bulk of advancing ice creaks, cracks, groans and rumbles as it inches forward into the lake. 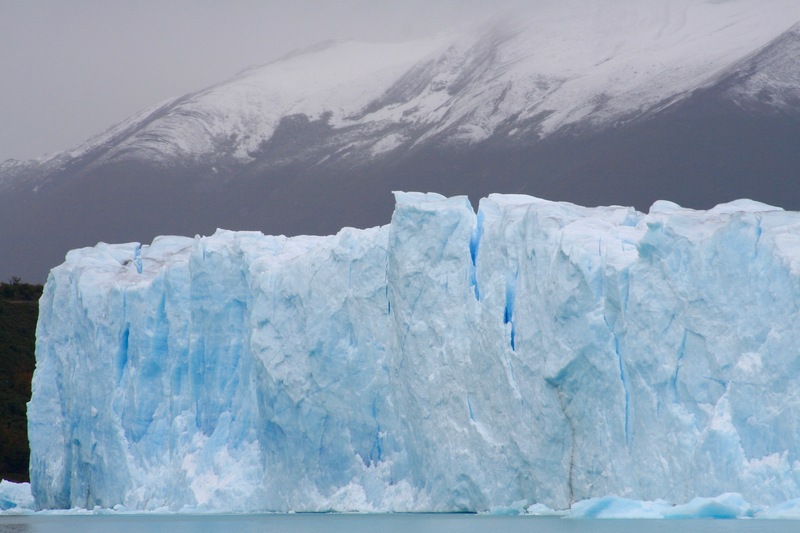 Then there’s the thunderous sound of vast hunks of ice calving from the blue wall and crashing into the water below. 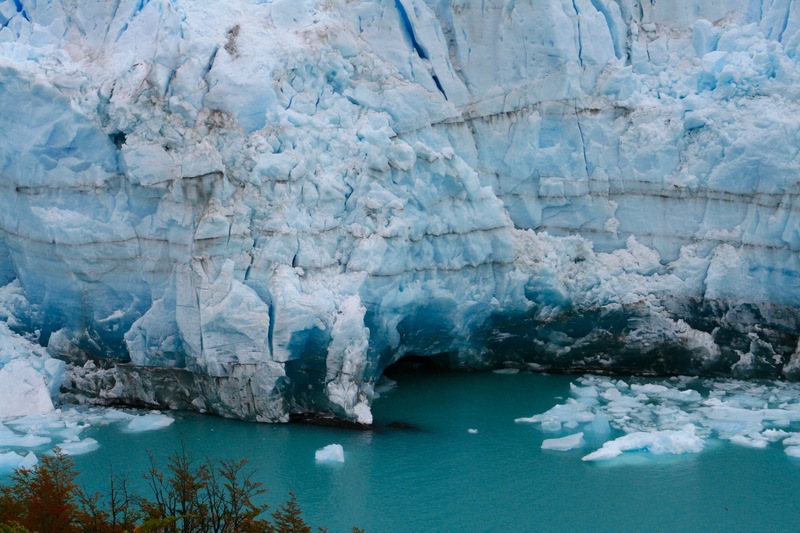 For something that moves at (wait for it) a glacial pace, it is certainly very active. There are several hundred meters of wooden walkways that you can stroll along to get ever-changing views of the ice and mountains. 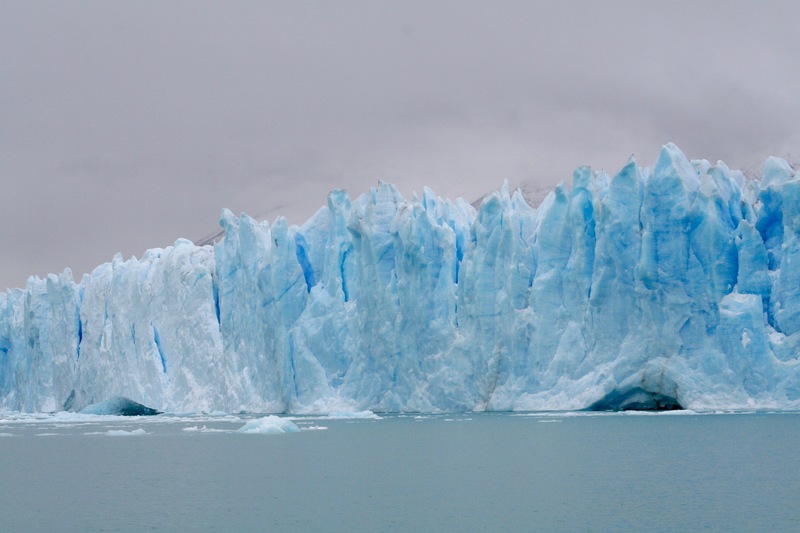 To get up close and personal with the ice wall you can take a boat from a small harbour on the lake. The boat stays at a safe distance from the ice in case large chunks calve, but you get close enough to see the truly amazing colours of the ice. When ice does calve the waves make the boat bob up and down. The sun was stubbornly stuck behind an impenetrable blanket of low cloud, which obscured the mountains down which the glacier slides. Luckily, as we reached the shore the clouds parted and the luminous glory of the ice was briefly illuminated. 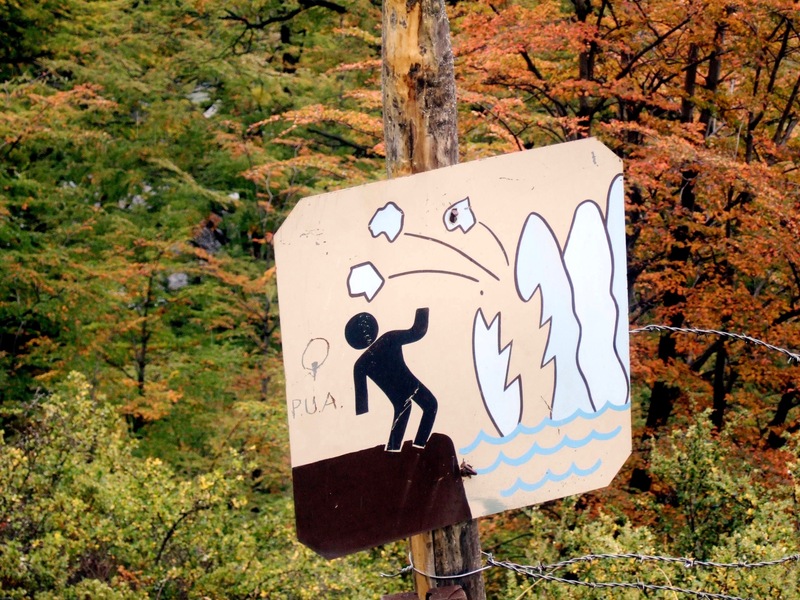 We made our way back to El Calafate utterly uplifted. 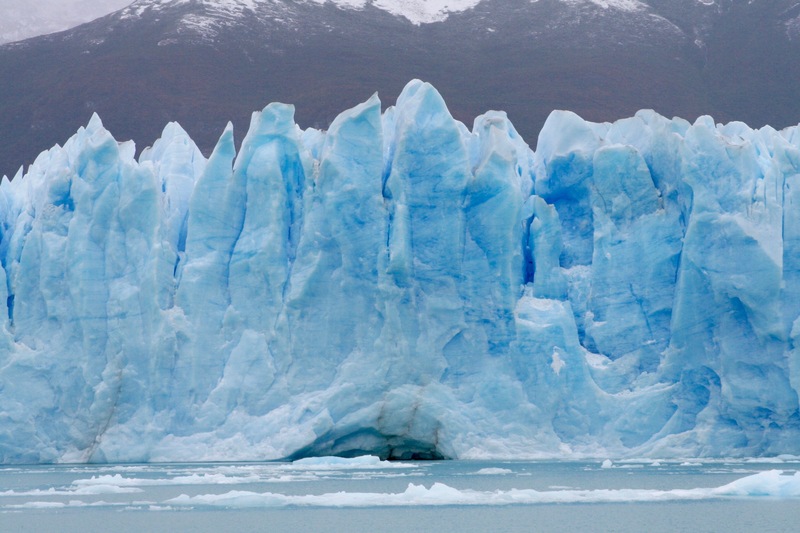 It is little wonder Los Glaciares National Park has received UNESCO World Heritage status. We went for a drink in town before eating a lamb asado, something of a Patagonian speciality. 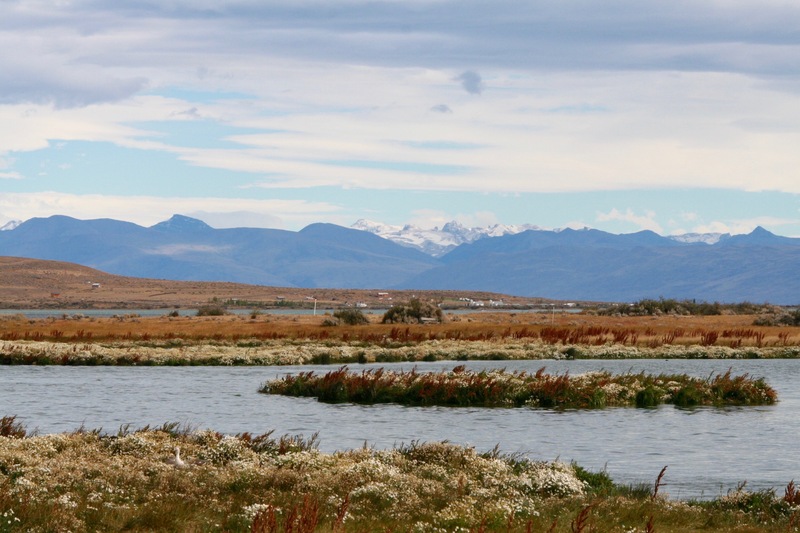 The next day we’d be flying north, but not before we had the chance to walk around Reserva Laguna Nimez and some of the lake shore. 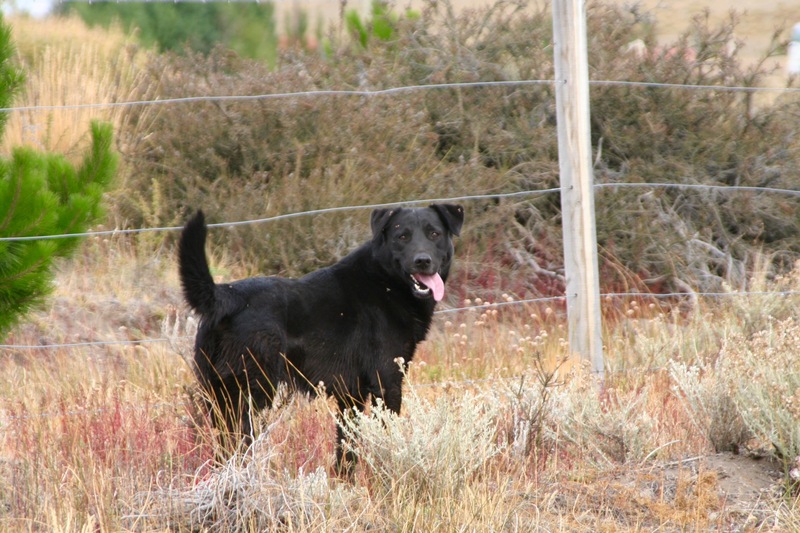 A very friendly dog joined us for the walk, and left again as we got back to the town. I like to think he stuck with us until he was certain we were safe.